River Time is a local brewery, operated by real people who care about this community. We love beer, meeting new people, the great outdoors, and having a great time. 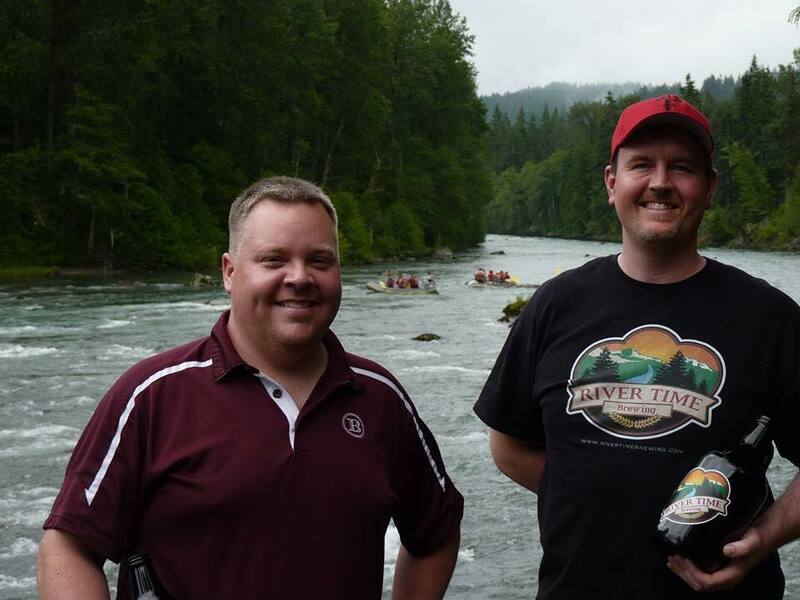 Lon (aka “Mr Tizzy”, “Hannibal”, Paper Pusher, The Emblem) and Troy (aka “T-Roy”, River Time East) are the two founders of River Time Brewing. The story of how we started brewing goes something like this: Lon and Troy were sitting on a couch watching Beerfest (or football), drinking beer. Troy turned to Lon and said “Ever thought about making your own beer?”. Lon replied “I did that once with a buddy, and I know some people who have, so lets do it.” We later realized we could make darned good beer. That turned into brewing by the Mighty Sauk River in Darrington over the years. They ended up making so much beer they got tired of giving it away, and got licensed. Neil keeps the beer flowing and the brewery functioning at River Time. We met Neil on the river when he would stop by after guiding trips down the Mighty Sauk. He started brewing with us and has never stopped. Do you love the Hammer IPA, the Hairy Porter, or Another Redheaded Stranger? These are all Neil! Kristin was River Time’s first employee, starting out in Public Relations. She was introduced to us by Neil to help out that first crazy summer on The River. You may see Kristin running one of her Brushes & Brews events, representing us at a Brew Fest, or slinging beer and pizza at River Time, but she does SO MUCH more… Kristin keeps everyone on schedule, manages most of our finances, and is a full time teacher! Our original hire at the new brewhouse, Madison is one of the greatest! When she’s not at the brewery taking care of our customers, you may be able to catch her at her local business in Darrington, Local Roots Salon – hence her position as our Corporate Stylist! Maggie has been hanging out at River Time since way back in the day – before we had a beer garden out on the river. She’s been a supporter of River Time for so long, and finally joined our team. Maggie runs all of the food operations at River Time – if you want something special or have a great food idea, Maggie is the one to talk to. Maggie also steps in with her amazing artistic skills to do our signage – so talented! Taylor started with River Time as one of our Public Relations personnel (slinging beers), and has since realized that she has a passion for making beer. She’s officially one of our brewers, helping Neil keep that beer flowing for you all. And yes, we did explain to her that brewing is 99% janitorial work, but she’s doing it anyway! If you like the Wheat Wheat or Raspbeery, you can thank Taylor for forcing us to make those beers. Born and raised in Darrington, Oliver has been hanging around the brewery since before he could drive on his own. You can catch him now working behind the bar or helping out around the brewery. If you need some advice for where to hike, camp, mountain bike, or throw a boat in a river, Oliver will set you straight! Want to become a Member of the River Time Team? Are you interested in supporting our community by keeping Our Values front and center? If so, please email us your resume to jobs@rivertimebrewing.com. Tell us why you think you’d be a great addition to this amazing team, and we will see where it takes us!